This is something I just threw together last night to balance out dinner. 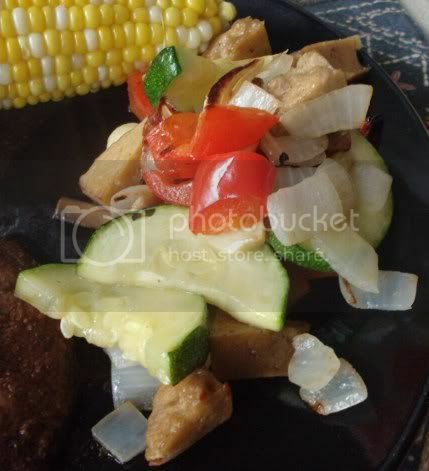 It’s simple and pretty versatile; you can use whatever veggies you have on hand. It would be an especially good way to use up a farmer’s market haul or the last of a CSA box! 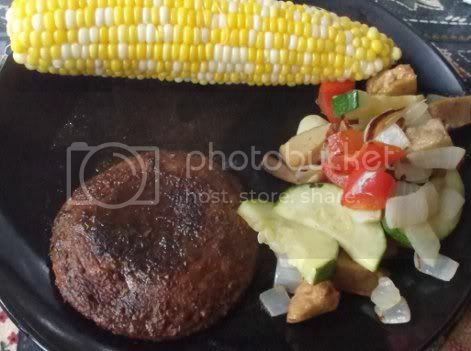 I served it along with jerk-spiced portabello caps and corn on the cob, but you could also serve it with seasoned rice, quinoa, or over a bed of greens. Or dump it on top of your favorite pasta! Get creative and enjoy. 1) Preheat the oven to 425°F. 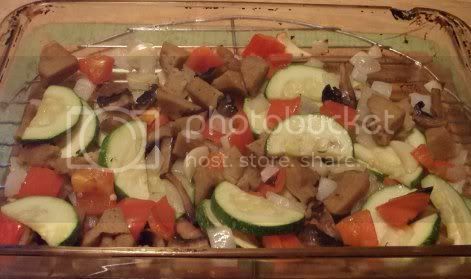 2) Place the seitan, vegetables, and garlic in a large glass baking dish. Drizzle with the oil and mix until everything is well coated. 3) Roast for 20-25 minutes, stirring occasionally, until veggies are tender and seitan is browned. Serve hot.